Things are moving right along now… Next on my to-do list was putting the new tie rods together. I applied a bit of anti-seize compound to the threads of the tie-rod ends to make future adjustments a little easier. Once the tie rods were put together I installed them on the car. Oops, I almost forgot to install the anti-sway bar! I don’t know how I forgot about it until this point, I guess I got sidetracked by the steering stuff. The new 1 1/8″ diameter bar that came with the suspension upgrade kit should be a big improvement over the relatively flimsy stock anti-sway bar. One obstacle to installing the new anti-sway bar was getting all the excess POR-15 out of the bolt holes for the sway bar bushings. After two coats of POR-15 and a top coat of Chassis-black, quite a bit of paint was plugging up the bolt holes and nuts. However, some careful prodding with a utility knife and flat head screwdriver took care of the problem and the anti-sway bar was bolted to the frame in about twenty minutes. Well, as it turns out I’m not going to be able to finish installing the sway bar right away. 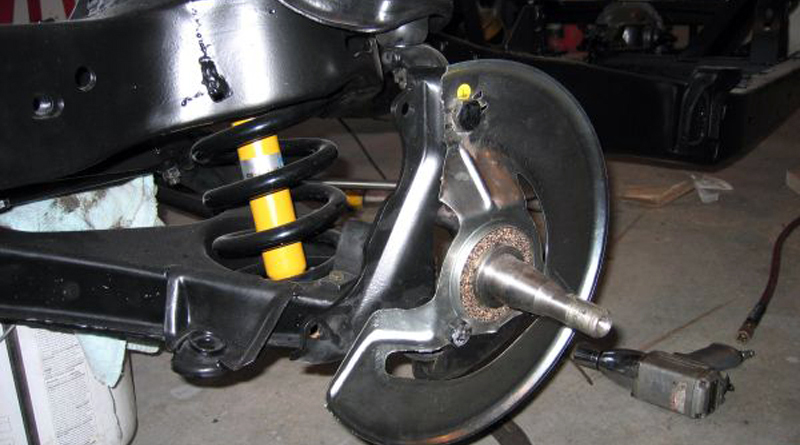 Without the weight of the vehicle compressing the front suspension the holes for the links that connect the sway bar ends to the lower control arms don’t align very well. Rather than force them into place I’ll add their installation to my “don’t forget to do this later” list. At this point the one major steering component left to be installed was the steering box and pitman arm assembly. Up to this point I’ve been procrastinating cleaning and painting the steering box since there’s a pretty hefty layer of grease and grime caked on it. Once cleaned and painted the steering box will bolt to the frame and the pitman arm will connect to the stud on the power steering control valve (shown in the lower right of the photo below). So what’s in store for the next update? I think the focus is going to shift to cleaning and rebuilding the steering box. Stay tuned for more updates and, in the meantime, why not stop by the forum? It’s a great place to ask questions, share your project, or to just talk Corvettes.